This guest post was written by Julie Geyer. Julie is a research technician in Joel Fodrie’s lab at the UNC Chapel Hill Institute of Marine Sciences, where her work focuses on the ecology of seagrass beds. She graduated from Cornell University in 2014, where she worked in both Nelson Hairston’s lab, as well as in Drew Harvell’s lab. Her current work looks to understand trophic linkages between saltmarshes and seagrass beds by looking at food web structure. Recently, she has also been involved in work with the Zostera Experimental Network (ZEN). In addition to studying the ocean, her interests include: cooking, running, learning about wine, and petting other people’s dogs. I was a really picky eater growing up, and dinner was no exception. I used to contemptuously leave my bread crusts uneaten. My dad however, would always savor those last pieces of crispy and chewy crusts. He explained to me that we should do an exchange; I would give him my crusts, and he would give me his warm, soft centers. He deemed this our “symbiotic relationship”. I didn’t know this at the time, but our relationship was even deeper than that; we had a mutualistic relationship, whereby we both benefited from our dinner trade. In marine systems, the concepts of symbiosis and mutualism are very much the same (minus the bread crusts). In general terms, we like to think of symbiotic organisms as those which live in close proximity to one another and interact in some way, shape, or form. Symbiosis can further be divided into 3 broad categories: mutualism (where both organisms benefit from an interaction), parasitism, and finally, commensalism (see figure below). In order to tackle this hugely important and diverse field, I’d like to focus on just one type of interaction in this post: mutualism. I hope to illustrate some of the ways in which these relationships play out, while also giving you an appreciation for just a few of the fascinating and diverse organisms that we see in our oceans. Three types of symbiosis in marine environments. Figure by Julie Geyer. A Case Study: Phytoplankton, Krill, Seabirds…And Climate Change?? I promise that my title wasn’t just a shameless plug for Kendrick Lamar. But yes! Krill. These super tiny marine zooplankton may actually play a role in global climate change. We tend to think of krill as serving one purpose in life: whale food. 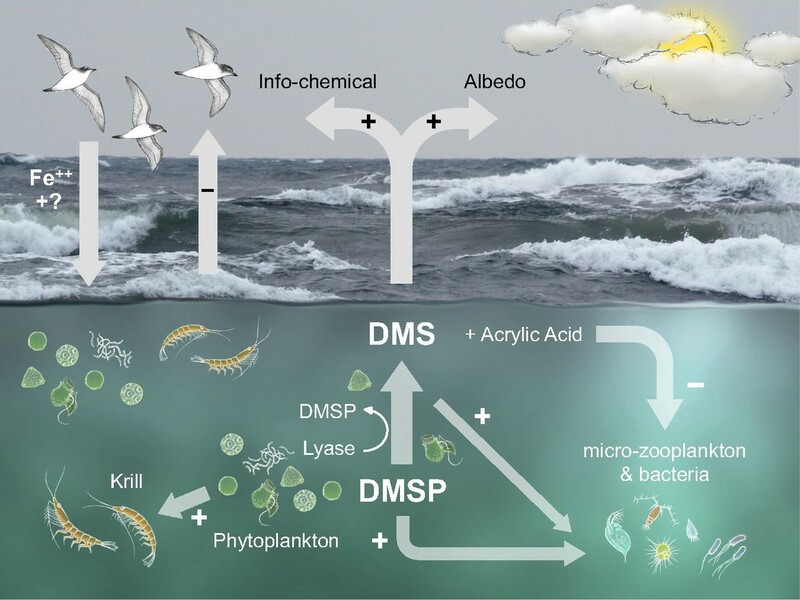 However, this multi-tiered mutualism, where krill are the middlemen that facilitate a mutualistic relationship between phytoplankton and seabirds, is beyond cool. This interaction starts at the very bottom of the food chain, and coincidentally, also at the very bottom of the planet, in the Southern Ocean. Marine phytoplankton are microscopic marine plants, and are consumed by zooplankton, like krill. However, when consumed by krill, these phytoplankton fight back by releasing a chemical known as dimethyl sulfide (DMS). As it happens, DMS attracts krill-consuming seabirds, which typically use this olfactory cue to navigate the vast oceans. 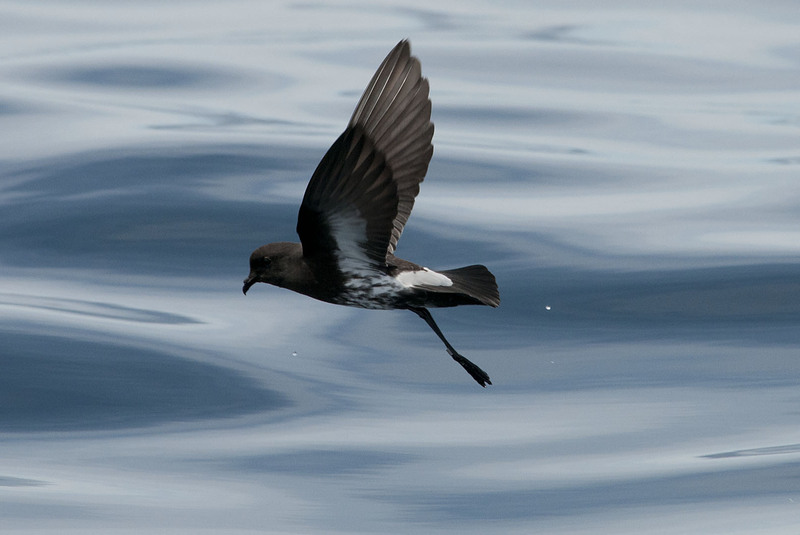 So now you have this strange and unlikely partnership between tiny marine phytoplankton and predatory seabirds, whereby the phytoplankton actually attract seabirds to their food source: krill. But the phytoplankton aren’t without benefit. Where there are birds, there is poop…am I right? This bird guano may not be so nice on your windshield, but in the Southern Ocean, where nutrients are limited, it provides an iron subsidy crucial to the growth and survival of phytoplankton. But this relationship gets even stranger. Dimethyl sulfide (the same compound exuded by phytoplankton) is a chemical compound that, once evaporated and released into the atmosphere, promotes formation of clouds. When you have more clouds, you have less solar radiation reaching the Earth’s surface, and therefore, less warming. So essentially, the solution to global climate change is to have krill consume more phytoplankton? Just kidding. 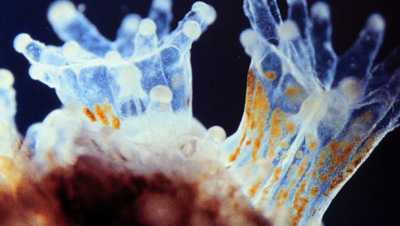 A coral polyp with symbiotic zooxanthellae; brightly colored reef-building coral (Montipora monasteriata). In a lot of ways, I believe that “symbiosis” is a perfect metaphor for the ideal relationship between us, as individuals, and the oceans. We nurture, protect, and monitor, and in turn, we benefit. We have seen the breakdown of this relationship in many instances, and some would even say that at present, it’s completely one-sided. We’ve taken many resources from marine communities, but the real question, is: how do we fix our relationship so that we mutually benefit? Tags: Climate change, Coral, Guest Post, krill, Marine life, mutualism, phytoplankton, seabirds, Southern Ocean, symbiosis. Bookmark the permalink. This is so cool! 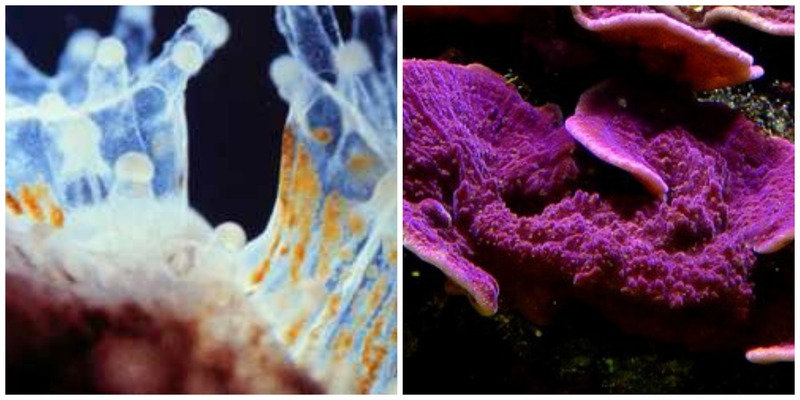 It seems like the symbiotic relationship between corals and zooxanthellae is the primary example used in Marine Science classes and communication. 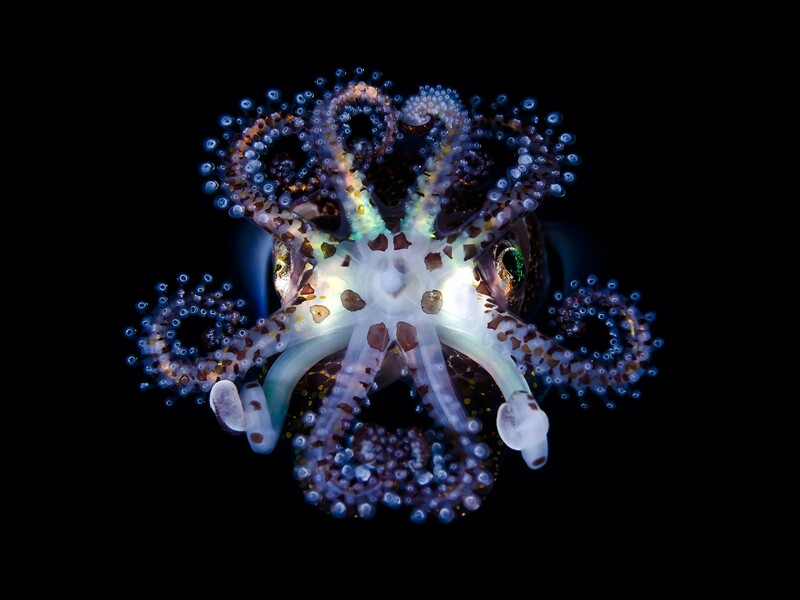 I’ll have to look into other mutualistic, symbiotic, and even parasitic relationships in the ocean. I’m sure there are tons! Of course, there are countless other examples, but I find these to be some of the most interesting ones! Thanks for the list! I’ll definitely check those out!